Super Genius Games promises to donate 100% of the proceeds of this PDF to the Red Cross to help the victims of disasters, initially focusing on the Moore, Oklahoma tornado. The Geniuses would also like to thank world renowned illustrator Wayne Reynolds, who kindly donated the sketch used for the cover of this product. The sketch, and his kind gesture to make it available, not only inspired the Order of Merciful Cousins, but this entire charity pdf. 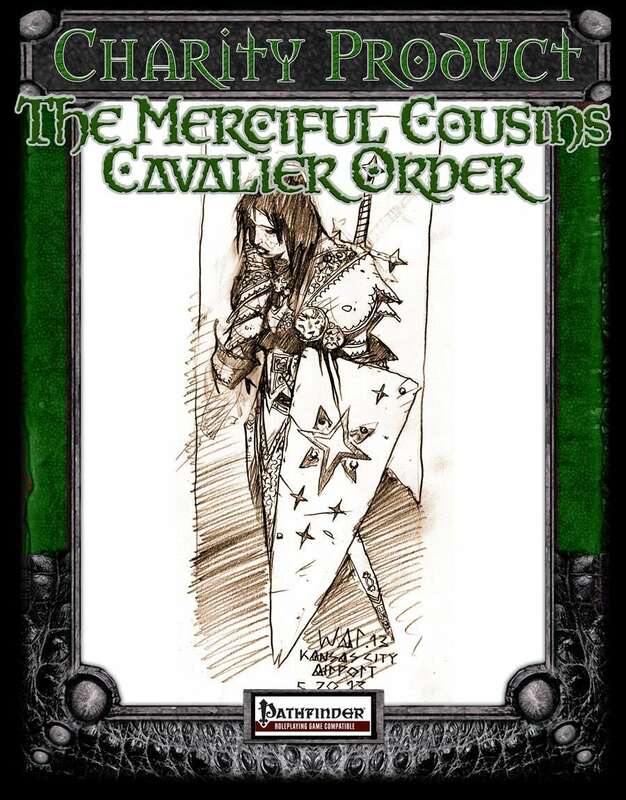 The Order of Merciful Cousins, who also go by the name the Masons of Recovery, are an order available for cavaliers (a class presented in the Pathfinder® Roleplaying Game: Advanced Player’s Guide™). Dedicated to assisting those who have suffered tragedy or disaster, the merciful cousins wander the world trying to help those communities in greatest need. In addition to defending those too weak or shocked to defend themselves, the merciful cousins spend time healing the injured, rebuilding shattered homes, and helping communities plan to better weather future hardships. The merciful cousins see themselves as kin to all the distressed and dispossessed, and believe communities that have suffered significant disasters must be protected and helped to rebuild. Of course, the cavaliers also believe in preventing such disasters before they strike and are happy to hunt down bands of pirates or brigands, secure destructive artifacts before they fall into the wrong hands, and help protect caravans and keeps where danger looms, but has not yet befallen. But if a community or settlement has already been ravaged, that is the where cavalier’s first duty lies. The symbol of the order is two four-pointed stars overlapping one another. These represent the four pillars of their duty – defense, preparation, recovery, and rebuilding – both in the present (the front star) and in the past (the star in the background). Whenever an order of the merciful cousins cavalier helps a community recover from disaster, she adds another smaller star to her personal heraldry, much as soldiers mark their successes in major battles. To the cavalier, those she has helped are more important than those she has defeated. Hey guys! I've loved this product since it first came out. I was wondering if y'all had considered a 5e conversion of some sort?